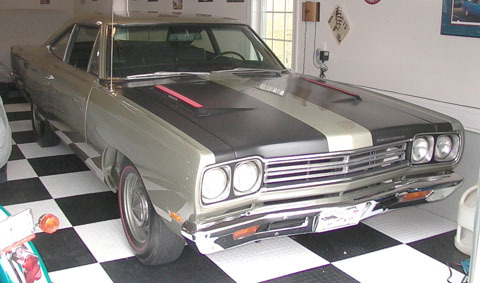 The 1969 Plymouth Road Runner was a smashing success for Plymouth. During 1969 the Road Runner was honored as Motor Trend’s Car of the Year and out sold expectations. Total production was doubled from the 1968 model. The combination of power and performance at a bargain price was too much to pass up. This was the glory year for the Road Runner. On the outside the differences between the 1968 and 1969 model years are minimal. New square side marker lights a slightly remodeled grill featuring four large rectangular inlets and simpler square taillights were the most obvious (see diagrams below). Plymouth stayed true to its roots with Road Runner and resisted any temptation for flashy add-ons. However, more color options were available this year. On the inside the car was nearly identical. However, you could order more creature comforts this year including bucket seats and the Air Grabber induction system. Under the hood were two options; the standard 335hp 383 V8 or the 426 Street Hemi. However, there was a new option this year called the Six Pack. This was not just a motor option but an entire car package built around straight line performance. The 440 6bbl Road Runner was performance built from the inside out. Starting with a 440cid Commando motor, three Holley two barrel carburetors were added to an Edelbrock intake. This motor made lots of horsepower and tons of torque (500lbs). It was not uncommon for this car to surprise a hemi on the street. The cars featured heavy duty suspension, brakes, and cooling systems along with Goodyear G70 Red Streak tires. True to its roots this car featured simple steel wheels painted black. On the outside the car was easily identified by its massive fiberglass hood with working scoop which was held in place by 4 hood pins. The hood was painted flat black and included a large 440 6bbl decal on both sides of the scoop. The car was available in red, green, yellow, orange, or white. Plymouth sold a total of 85,000 cars during 1969.